I'd like to share some exciting news with all of you! My eldest daughter is engaged! The story is sweet and it's clear to see God's hand moving in both of their lives! My Goosie's getting married to a wonderful, godly fellow who loves her very much. He is everything a mom could ask for her daughter and I'm gonna have a son! God is good. It's interesting the way God brings you to the perfect place and time to reveal something you've been waiting for all your life. Ben talks a little about the way this happened in his newsletter below. 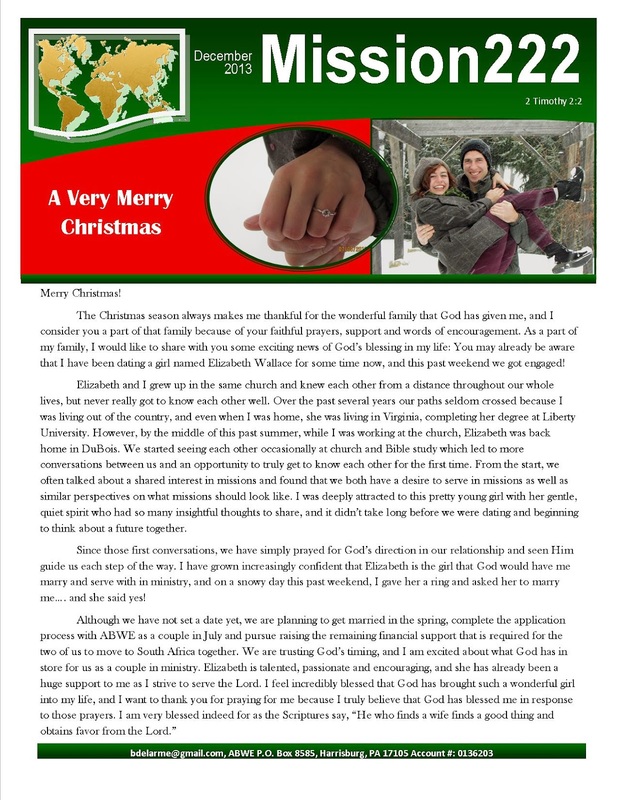 The newsletter shown below is from my daughter's new fiancé regarding their engagement and his plans for the mission field. Ben has been raising support for his ministry and had planned to return to South Africa in early 2014 but now they will begin raising the necessary funds to go to the field as a couple. Please pray about this. Your support would be greatly appreciated in prayer and/or financial means. Ben's missions account number with ABWE is at the bottom of the news letter if you feel led to contribute to their support as they plan to head back to Africa together. Thank you for taking the time to read what Ben has to say.